If I am in need of a recipe for a certain kind of cookie, casserole, or whatever, I normally just Google and select one from the internet that looks quick and easy. However, sometimes I like to browse through an attractive cookbook and choose something that looks or sounds interesting. What fun is cooking, if you are afraid of trying something new? THE FOOD 52 COOKBOOK is just the thing for anyone wanting to put a little fun into cooking. It is a collection of 140 recipes, mostly from home cooks, assembled by Amanda Hesser and Merrill Stubbs from recipes submitted to the blog, “Food52.com.” The recipes are all winners of “52 weeks of official contests.” They were tested and judged “winners” by the members of the Food52 community, that is, the contestants’ peers. Members of the Food52 community are committed to the proposition that the preparation and consumption of food should enhance the quality of one’s life, not just perpetuate it. The recipes are arranged by seasons–summer, fall, winter, and spring–not by categories, as in a traditional cookbook. Each recipe is introduced by a comment that arouses the reader’s curiosity. For example, a recipe for Ginger Sangria submitted by Rebecca Palkovics reads: “If traditional sangria were a small, feisty brunette, this variation would be a tall, leggy blonde.” Hmmm, I never thought of sangria in that way. In fact, I never thought of sangria at all until I started browsing through THE FOOD52 COOKBOOK. The recipes are followed by instructions on how to properly prepare them, very colorful pictures, information about the cook who submitted the recipe, and a comment from a member of the Food52 community. One identified merely as “Bladt” said of the Ginger Sangria: “Tasted this at a dinner party–quite good. The ginger is rather subtle and the brandy played nicely with the fruit.” Now, doesn’t that make you want to try some? The book itself is very attractive. Nice, clean white pages gently sprinkled with delicious photographs makes this a great gift idea for oneself or anyone who loves food. In fact, I do not think you would necessarily have to actually prepare any of the recipes to enjoy the book. 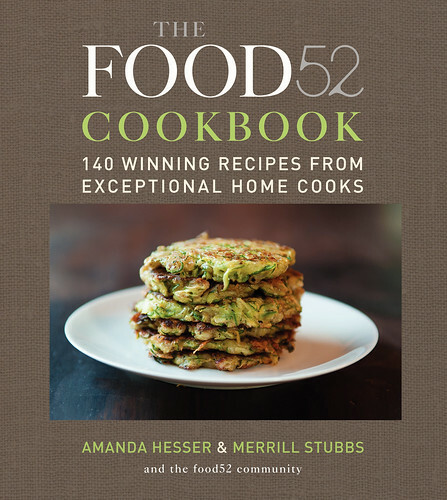 This entry was posted in Book Reviews and tagged Amanda Hesser, Cook, Cookbook, food, Food52, Google, Merrill Stubbs, Recipe. Bookmark the permalink. You make me want to get a copy! Good stuff, there. When you have the time, do drop by my space. I just made some Ferrero Rocher bars and would love to hear what you think. Cheers! Thanks for commenting. Congratulations on becoming a Vogue India blogger. Keep cooking. My favorite part: Seasonal menus and lovely photos. Least favorite part: Not much of an index.